If you are ready to meet your soulmate or a twin ﬂame of a garden variety (and we all have more than one), then Sharon Slowik is a matchmaker for you. Sharon is a plant whisperer. Her pioneering botanical oeuvre spans from creating “intelligent” experiential textiles to an essential oil and a horticulture therapy. Revealing our individual relationships with plants, it’s effects and beneﬁts, her multidimensional botanical work radically shifts our attention to the inﬂuential presence of the plant kingdom in our lives. By facilitating the custom-ﬁt alliances with plants which are uniquely our match, created through her artistic expression and healing practice, we are offered an opportunity to become intimately engaged with our phyto-partners on the path to profound personal growth and transformation. Raising our awareness along the way, we are faced with a subtle reminder of sometimes casually ignored fact that we equally share the planet with other species. Early on Sharon’s childhood curiosity stimulated her keen observation of the patterns occurring in the natural world. Her houseplant playmates and the caregiving activities of the family garden, initially nurtured her imagination and inspired her to become an accomplished textile artist and a fabric development expert. Her fashion runway originals, some of which are conceived as organic collages or take form through the technique known as “solar” printing, are true examples of co-creating with nature literally, using it as the ﬁrst palette and the source. With the ability to feel the connection and attune so closely to the plant’s journey, Sharon stepped “outside the corporate box”, turned over a new leaf and leaped into the world of ethnobotany and essential oils to focus on her natural love. 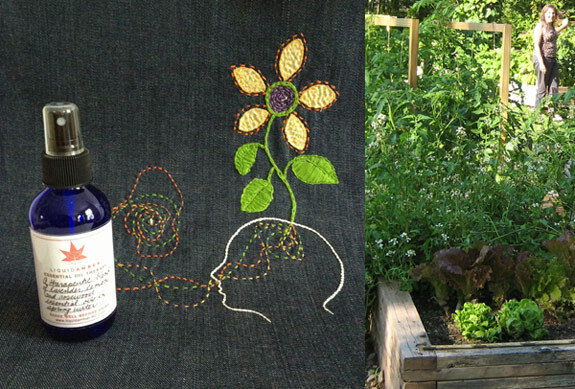 Her intuition unlocked, empowered with greater knowledge, mixing aesthetics, science and spirit, Sharon’s botanical arts emerged as a textile collection Rose of Sharon and Liquid Amber – an essential oil therapy practice. Liquid Amber intuitive work differs from the traditional aromatherapy. Sharon creates custom-blend formulas for a bath therapy with focus on the puriﬁcation of the energy ﬁeld that surrounds physical body. By rejuvenating and balancing our energy, the process towards health and overall wellbeing is accelerated. Deﬁned by the ancients as the “moisture of love”, water is a great ampliﬁer of the essential oil properties. Through a meditative contemplation, in a womb-like, reﬂective water state our psyche is awakened to fully surrender to the intense intimacy and the healing that is taking place. In addition to the personalized therapy Liquid Amber therapeutic product range consists of the phyto-companions on the go for the general public. Room Sprays Spring, Summer, Autumn, Winter are the blends that link us to the natural seasonal rhythms and the ﬂow of our existence. Pocket size Aroma Inhalers Soothe Nerves, Uplift Spirit and Fully Loaded assist us to stay emotionally grounded, conscious and in the moment, improving our surroundings wherever we are. Expanding its reach, Liquid Amber and Rose of Sharon story is unfolding. Sharon Slowik’s work is truly inspiring, and the style with which Marina Rybak writes about it allows it to unfold its creative spirit right here on the screen. Marina, your writing is only surpassed by your designing… Thank you both for the inspiration! What a wonderful article about my sister Sharon. Her talent and studies are so extensive that she has been able to help many people with her aromatherapy and essential oils. 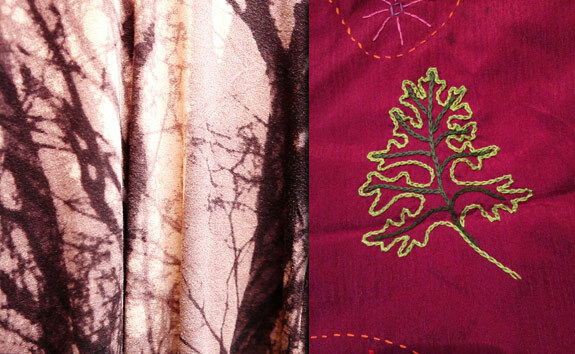 Her textiles are as calming and beautiful as nature itself. Sharon has a true gift and has chosen to share it with all of us. Thank you Sharon!